This is the companion Web site to The Macintosh iLife '06, the world's top-selling book on Apple's iLife software (learn more). "The best computer book ever, bar none." "The hands-down best value ever. Clearly written and colorful and highly informative." "Best supporting tech resource I've ever used." "The best illustrations I've seen in a computer instructional book!" "This is one of the best technical books I have ever read." Welcome to "The Digital Hub," my semi-regular podcast, produced in GarageBand 3, dealing with iLife and related digital media topics. Episode 2 of "The Digital Hub" is approximately 19 minutes long. In it, I spotlight the updates that Apple has released since iLife '06 shipped in January; discuss the growing number of car manufacturers providing iPod integration; talk about a couple of inexpensive alternatives for playing an iPod in your car; and demonstrate a free audio filter for GarageBand that can make your music sound like it's playing from a scratchy vinyl record. Download "The Digital Hub" Episode 2 (19-minute enhanced podcast; 9MB file; iTunes for Mac or Windows required for playback). Download "The Digital Hub" Episode 1 (50-minute enhanced podcast; 24MB file; iTunes for Mac or Windows required for playback). If you click the links above, the podcast may play back in your browser window. Control-click or right-click on the link instead, then choose the shortcut menu's Download command to download the podcast to your hard drive. Tip: Each episode of "The Digital Hub" is an enhanced podcast—it contains chapters that let you jump to specific locations within the podcast. Some episodes also contain Web links and synchronized artwork. 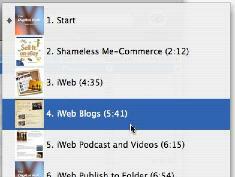 To jump to specific chapters in iTunes, use the chapter menu to the left of the Search box. On an iPod, press the Previous or Next buttons. 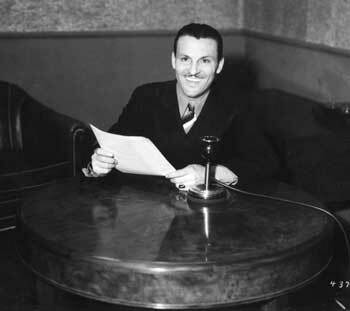 Above: A radio pioneer—George Heid, my dad—at the microphone, sometime in the 1940s.